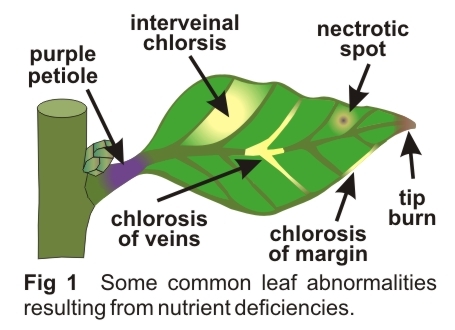 Monitor plants closely for symptoms of nutrient deficiency. These symptoms can provide a valuable forewarning of serious problems within the growing system. 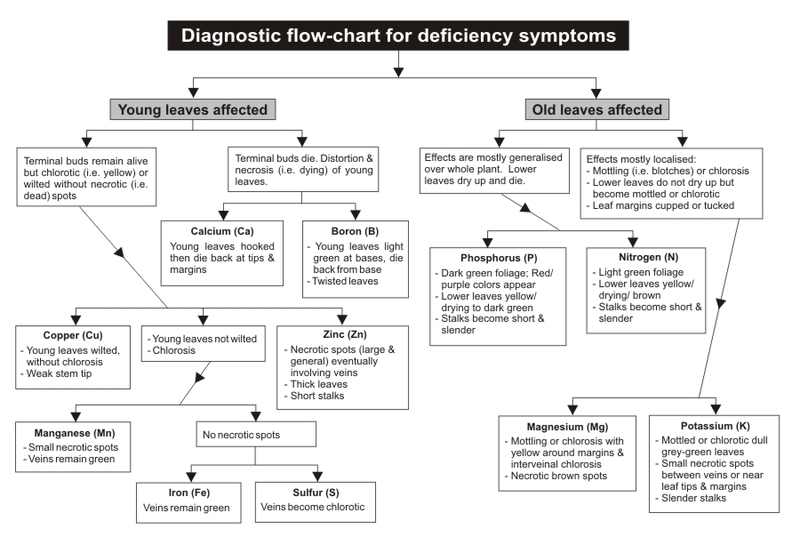 The early detection of deficiency symptoms is important because symptoms are often more unique and easier to distinguish when they first appear (Refer to flow-chart below). Yield loss can also be avoided. Early detection also prompts the need to check for other possible causes such as excessive humidity and poor EC and pH control. Note, deficiency symptoms can be easily confused with symptoms arising from insect attack, diseases, under-watering and genetic abnormalities. Sometimes in intense indoor growing applications — especially when carbon dioxide levels are supplemented to beyond normal atmospheric conditions—plants demand even more nourishment. Nutrient deficiencies such as leaf curl and yellowing tend to show themselves in plants that are directly under the grow lights—as these are growing the fastest. Move taller plants to the periphery—try to achieve a slightly ‘concave’ canopy that dips directly beneath the grow lights. 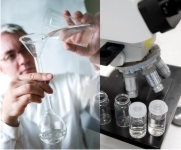 Our specialist product, FloraMax Ca-Mg-Fe, helps to mitigate common growth abnormalities and deficiencies in fast growing, short-cycle plants.